1000 x 1000 mm is a medium size of square wet room shower trays available in our store. It comes with complete drainage, including cover as well as waste trap. Multiple combinations allow you to customise the product so it fits both timber and concrete floor. Quality product having everything you need to install it straight after unpacking. Square metre walk in shower tray comes with 700 mm long linear drain channel. It is fixed to shower former and sealed against water. Other necessary parts are also included, such as suitable grating and waste siphon with water seal height of 20 mm and flow rate 26 l/min. 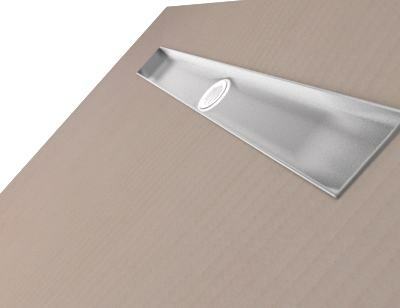 Ponente grating is a plain bar of brushed steel cover with no holes, only channels aside. It is made by McAlpine and can be easily connected to standard pipework. Square metre walk in shower tray comes with 700 mm long linear drain channel. It is fixed to shower former and sealed against water. Other necessary parts are also included, such as suitable grating and waste siphon with water seal height of 20 mm and flow rate 26 l/min. Zonda is a grill with angled rectangles across the entire top cover. It is made by McAlpine and can be easily connected to standard pipework. Square metre walk in shower tray comes with 700 mm long linear drain channel. It is fixed to shower former and sealed against water. Other necessary parts are also included, such as suitable grating and waste siphon with water seal height of 20 mm and flow rate 26 l/min. Tivano cover has 4 L-shaped rectangles with a square in the centre pattern. It is made by McAlpine and can be easily connected to standard pipework. Square metre walk in shower tray comes with 700 mm long linear drain channel. It is fixed to shower former and sealed against water. Other necessary parts are also included, such as suitable grating and waste siphon with water seal height of 20 mm and flow rate 26 l/min. Grate Mistral has a row of various sized circles regularly covering the surface. It is made by McAlpine and can be easily connected to standard pipework. Square metre walk in shower tray comes with 700 mm long linear drain channel. It is fixed to shower former and sealed against water. Other necessary parts are also included, such as suitable grating and waste siphon with water seal height of 20 mm and flow rate 26 l/min. Sirocco cover holes pattern consists 3 rows of squares, parallel to drain edge. It is made by McAlpine and can be easily connected to standard pipework. Chat started. Session ID: 1556252817. You are now connected to: David M.